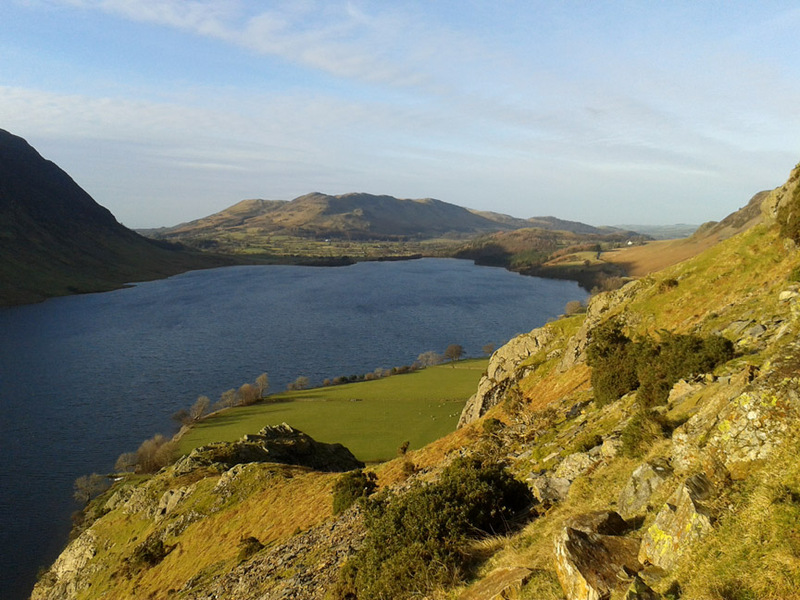 " Binsey and Rannerdale by Phone "
Date & start time: 6th and 8th February 2013. Walk details : All shorter walks of about an hour or two. 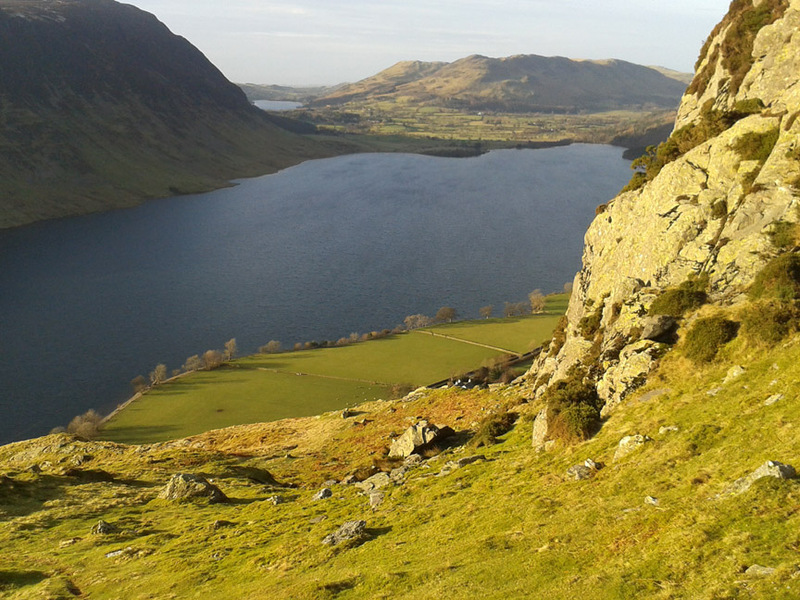 Highest point : The recent decision on Ennerdale. Walked with :Sophie and Ann with the dogs, Harry, Bethan, Harvey and Daisy for the first one. 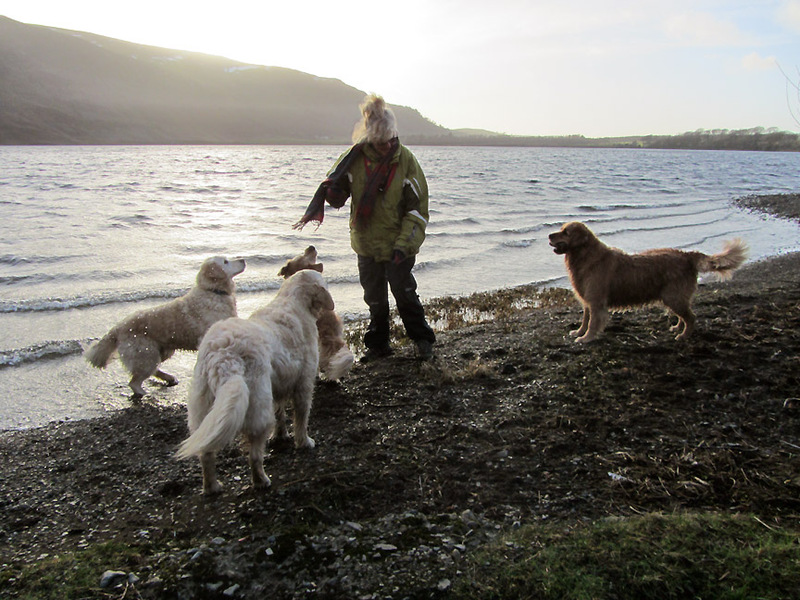 Just Ann, myself and the two dogs for the subsequent walks. Weather : As per the photos . . . unseen are the cool temperatures and cold breezes. Three walks this time, two of them done without the aid of a camera . . .
but as I've just updated my phone, I thought I would try out the camera that's built into the phone itself. 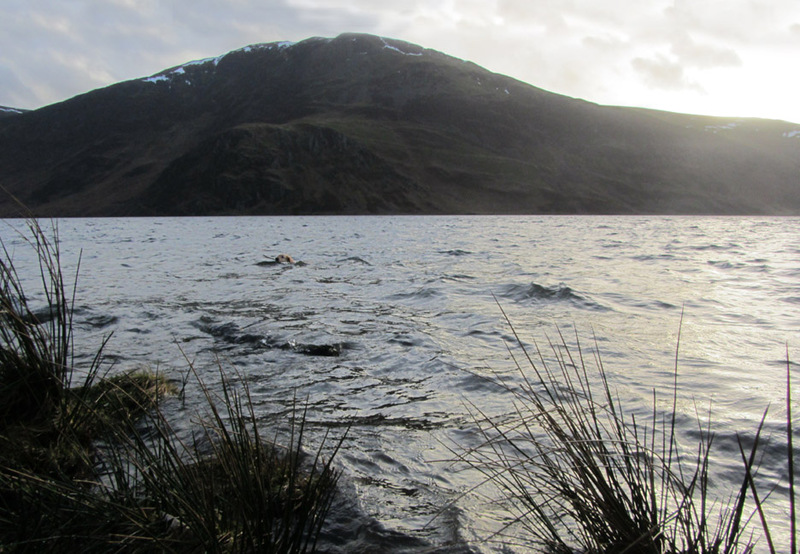 The first, more conventional pictures are Ann's at Ennerdale Lake last week. 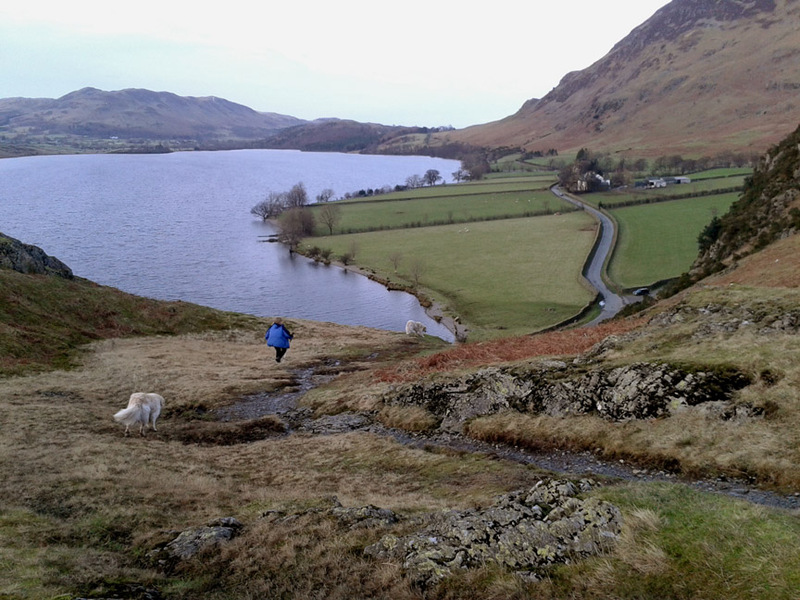 and ended up driving the short distance to Ennerdale for a walk from Bleach Green at the base of the lake to Bowness Knott and back. 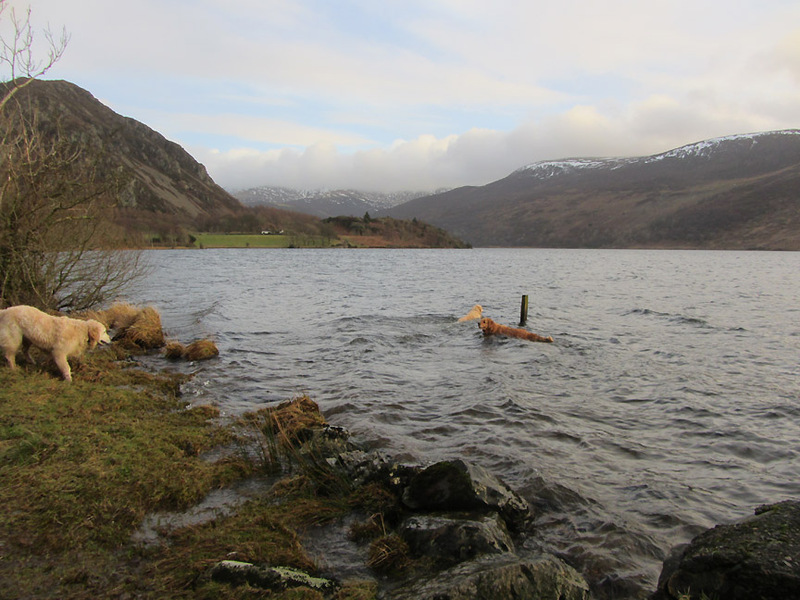 Sophie's dog Harvey is a very strong swimmer and avid stick chaser. especially the two boys, Harry and Harvey. Bowness Knott is on the left and its car park is in amongst the trees on the headland. 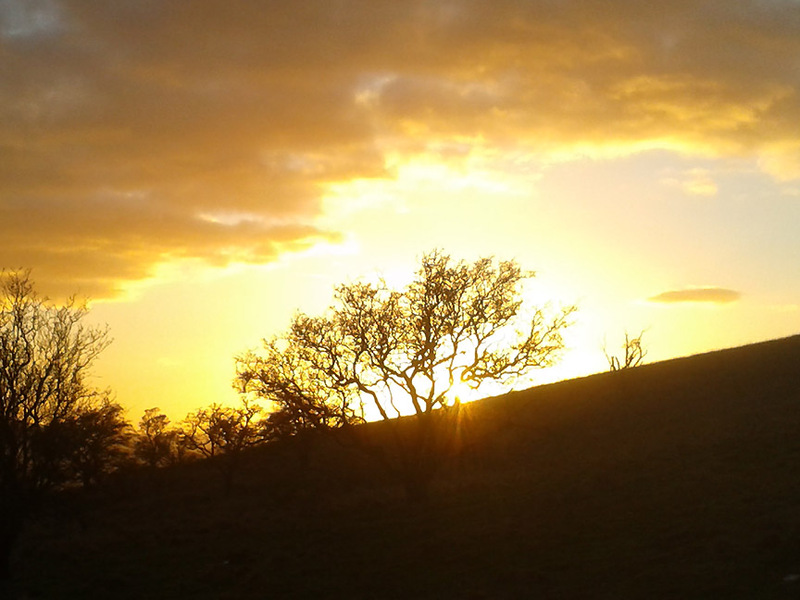 On the return, the sun was setting behind Crag Fell. Fortunately this area is safe from the developers for the foreseeable future, hopefully for all time. 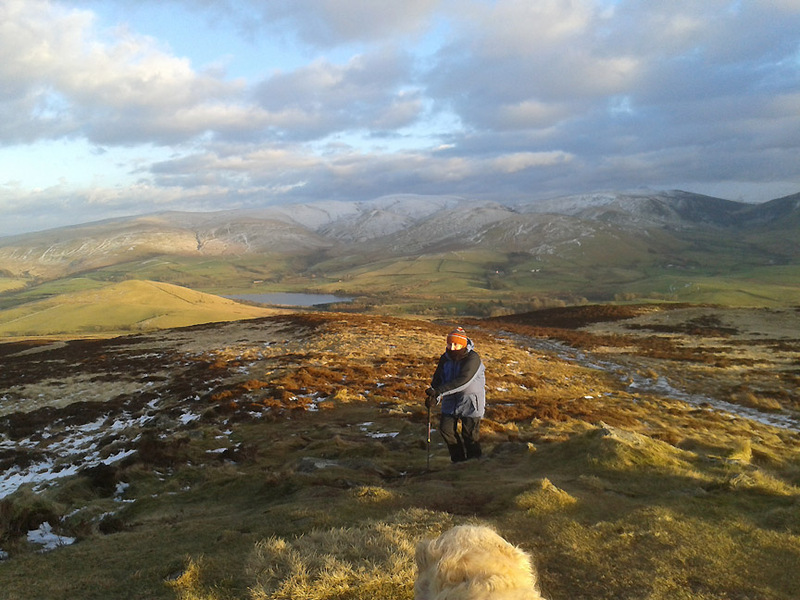 so we put the dogs in the car and drove to the outlying fell of Binsey, set back slightly north west from the Skiddaw Fells. We had guessed correctly . 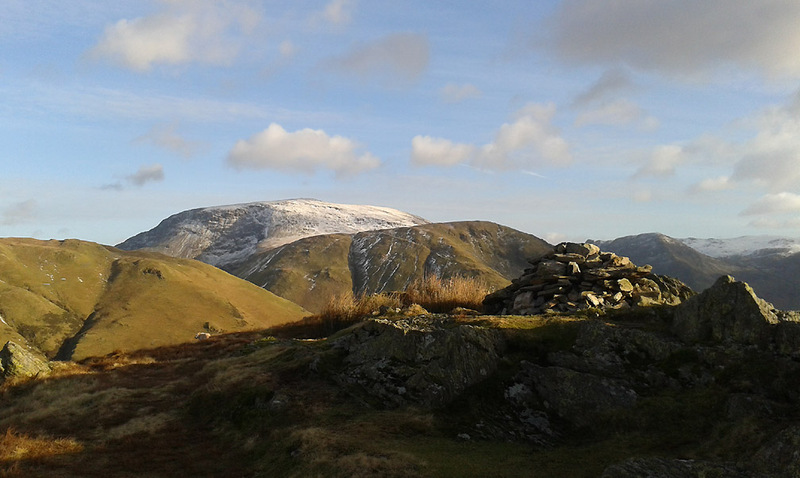 . . the cloud over the high central fells was not casting a shadow over this outlying Wainwright summit. 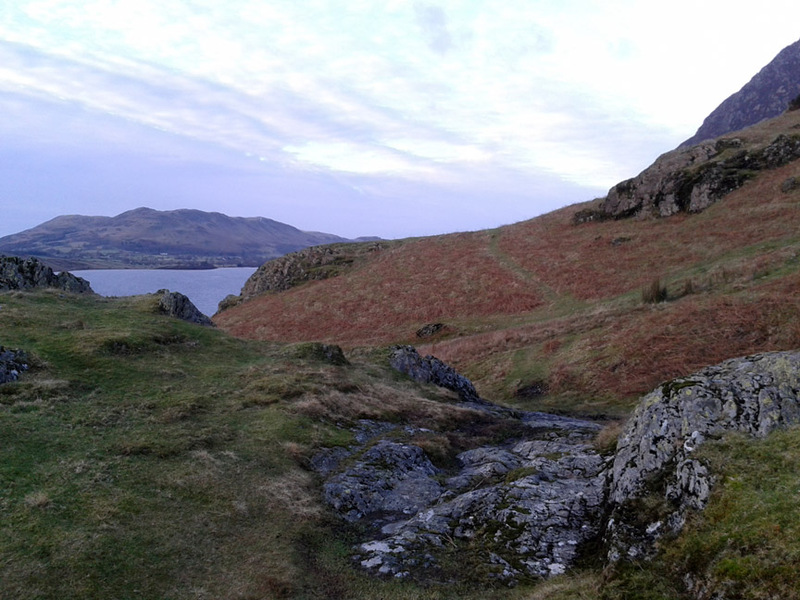 The ascent of Binsey from Binsey Lodge and the sheepfold alongside the road to Bewaldeth. 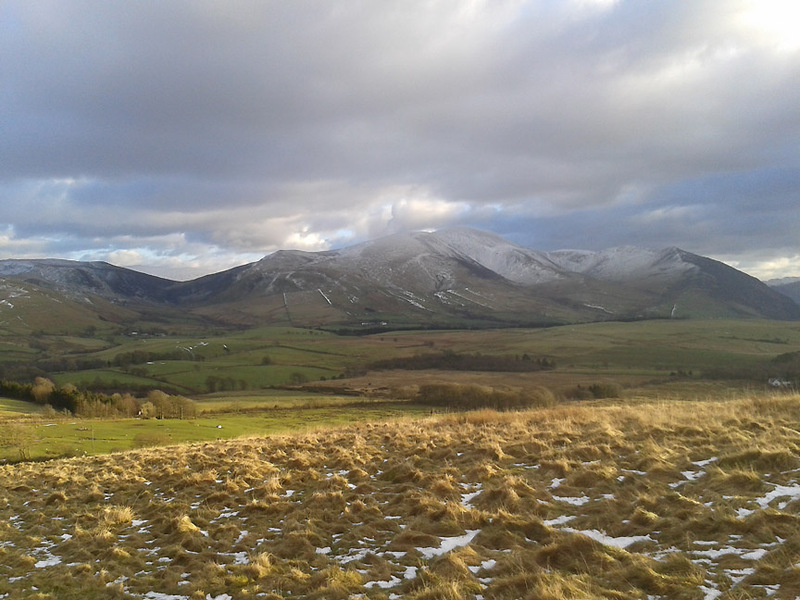 Skiddaw has no sun but does have a light snow cover which has been added to last night when we just had rain in our valley. 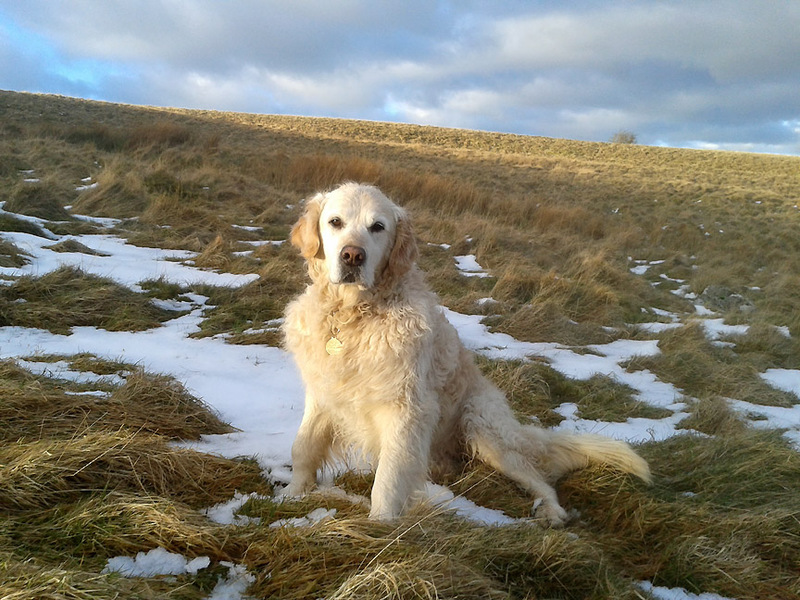 Harry sitting beautifully for a portrait in the sun on the way up Binsey. Ann looking at the view . . . not the camera ! She's well wrapped up against the cold wind. The Trig Point and Gps station . . . as pointed out by the O.S. chrome plaque on the face of the pillar. 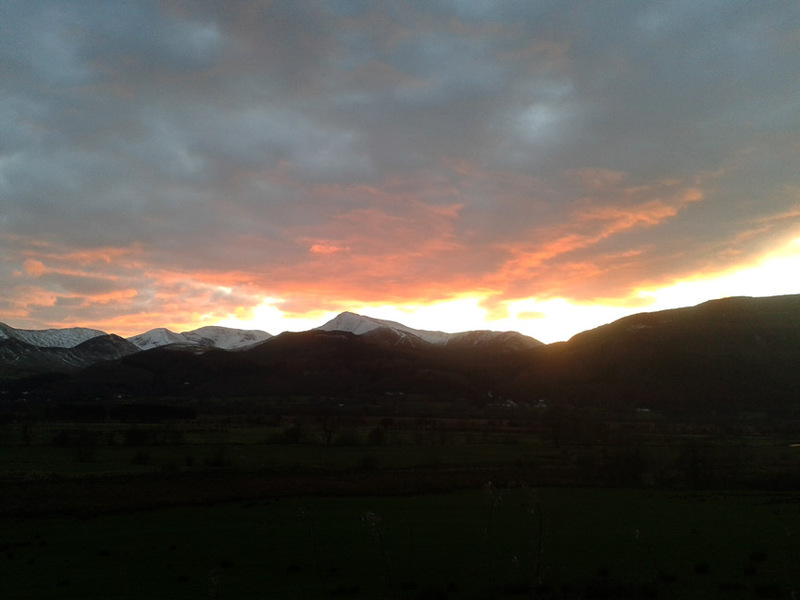 Looking the other way as the brightness starts to make its way round towards the higher fells. and was giving us, and no doubt the west coast, a lovely sunset. 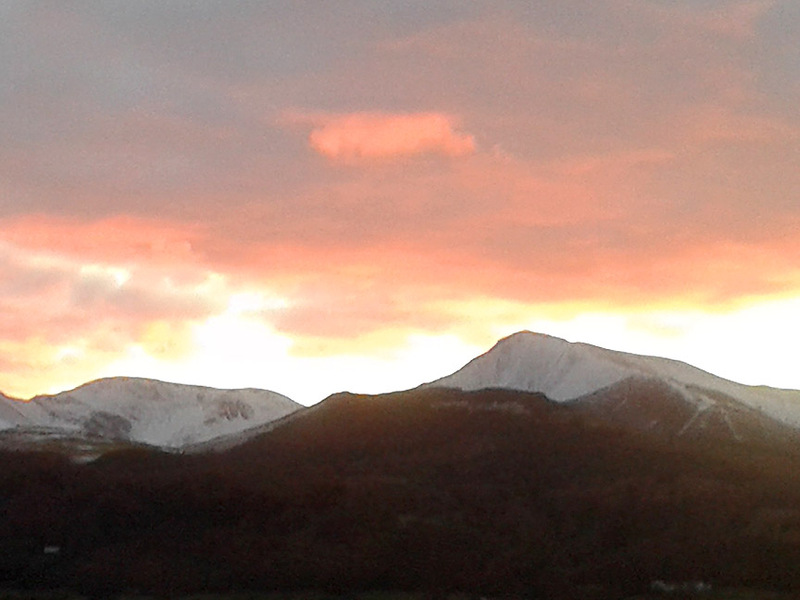 The sun was shining underneath the cloud to illuminate Skiddaw. 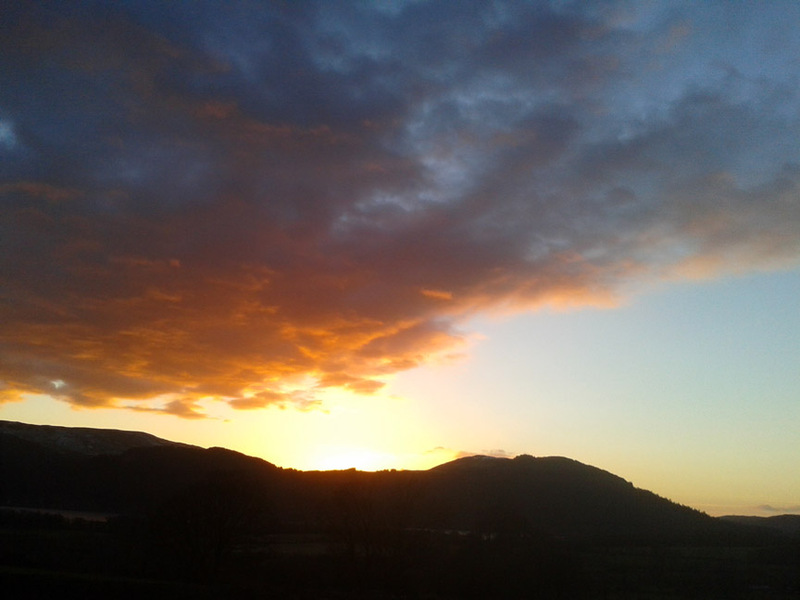 Back towards Keswick now (in the car) as the sun set further. 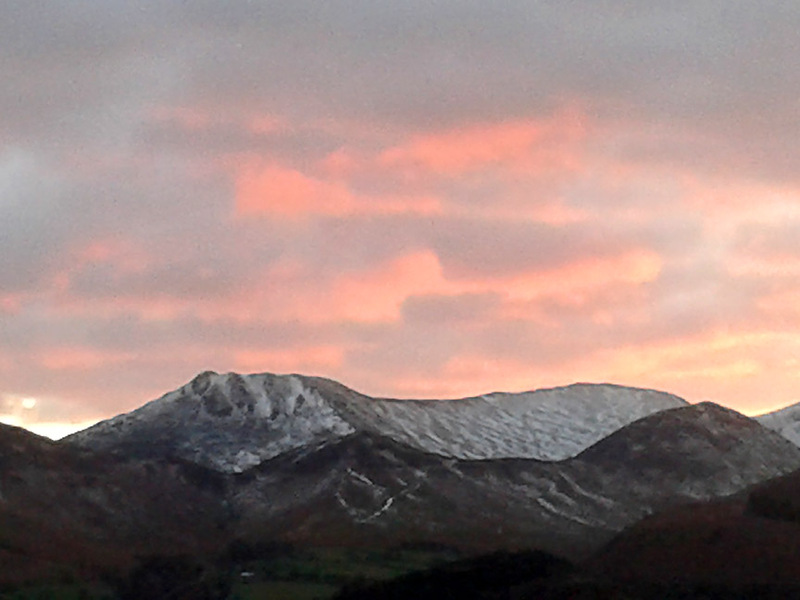 Almost pastel shades of the sunset over Causey Pike. There's no doubting the intensity of the sunset today though . 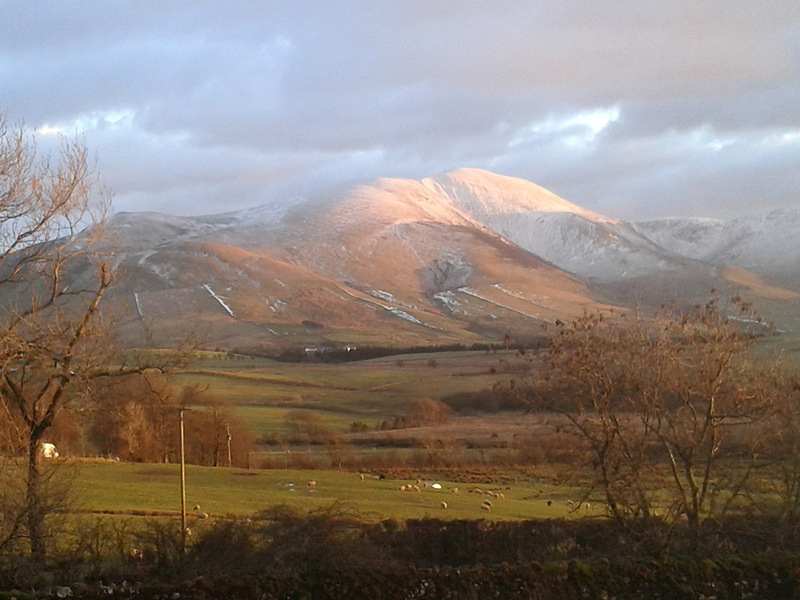 . . here's the light flooding over Sale Fell.
" Some work and some play prevents me becoming a dull boy . . . hopefully "
as you don't need to pick up, put down or hold the saw . . . much easier on the back ! Our third walk was later this same day after all the work had been done. 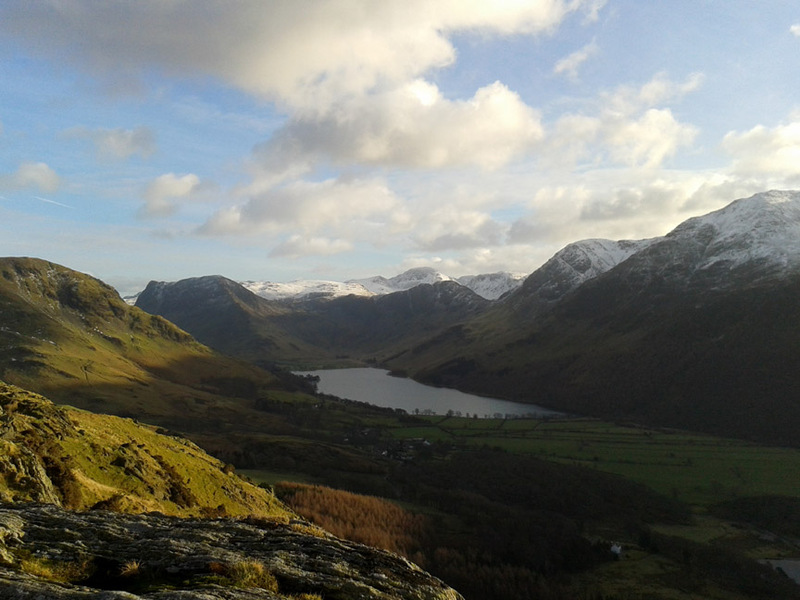 The lovely weather continued into the afternoon as we climbed the steep front of Rannerdale Knotts. 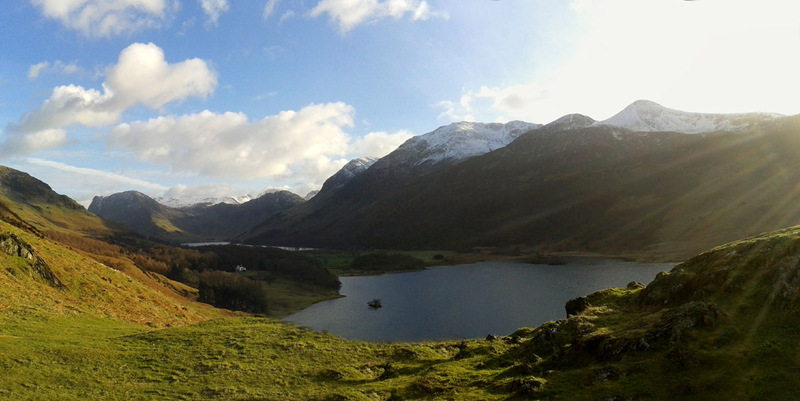 The view of Crummock, Wood House and the head of the Buttermere Valley. 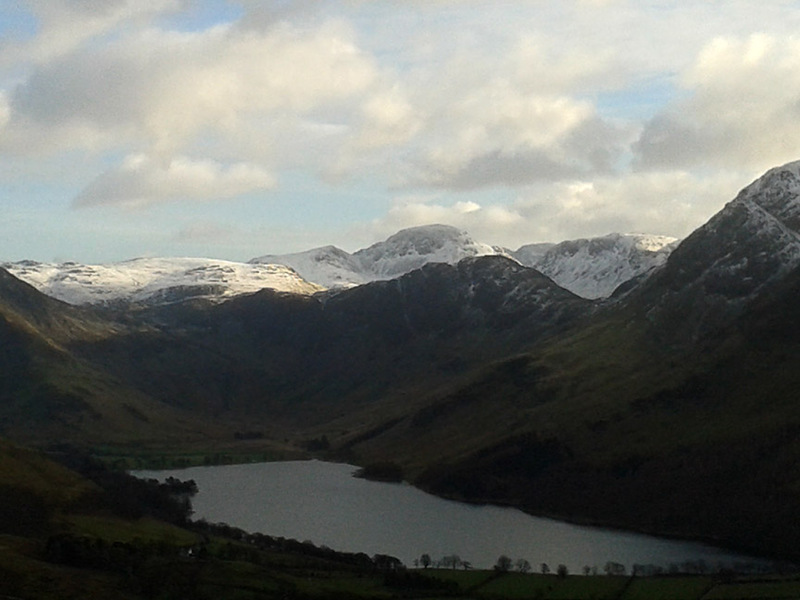 A slight snow covering on Grasmoor. One of those larger rocks has a geocache hidden alongside it, which I found on the way up the fell. 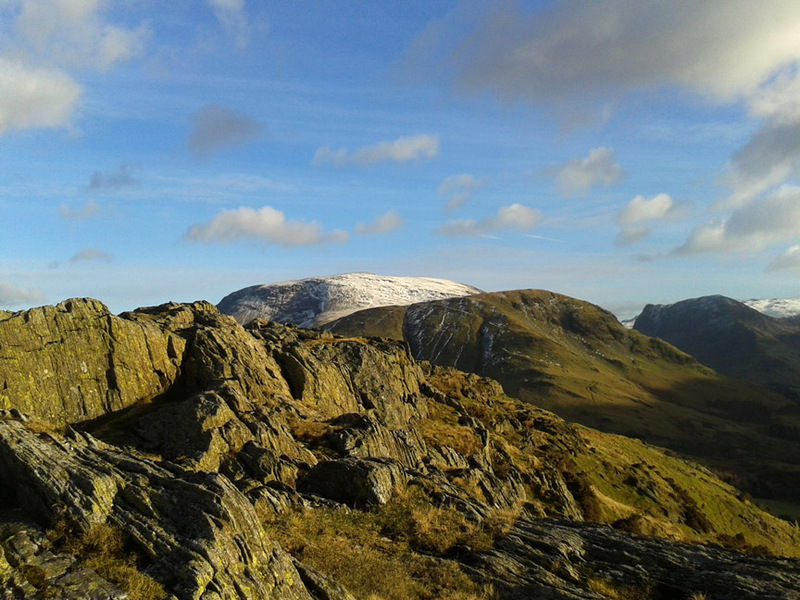 The snowy top of Robinson came into view. All the snow has gone from High Snockrigg but some of the zig-zag track we used with Jenna is just visible as a thin white line. 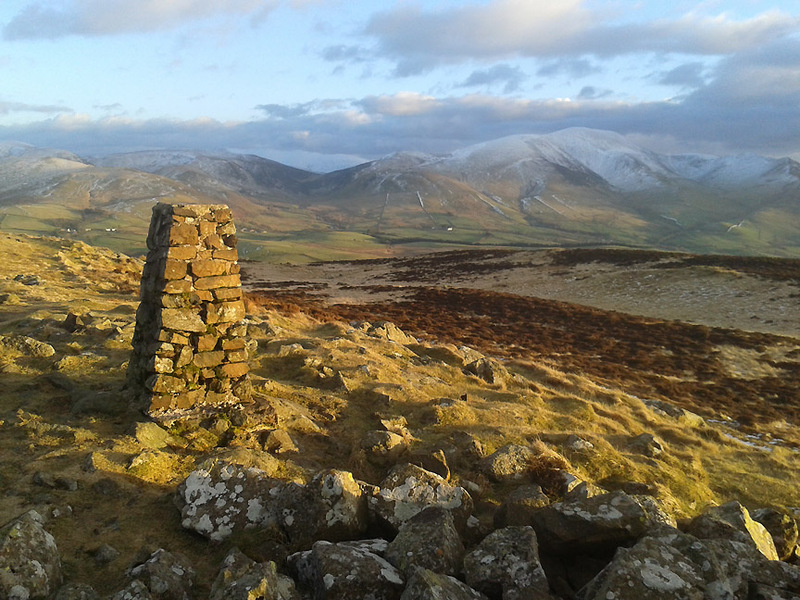 The classic view from near the top of the fell. 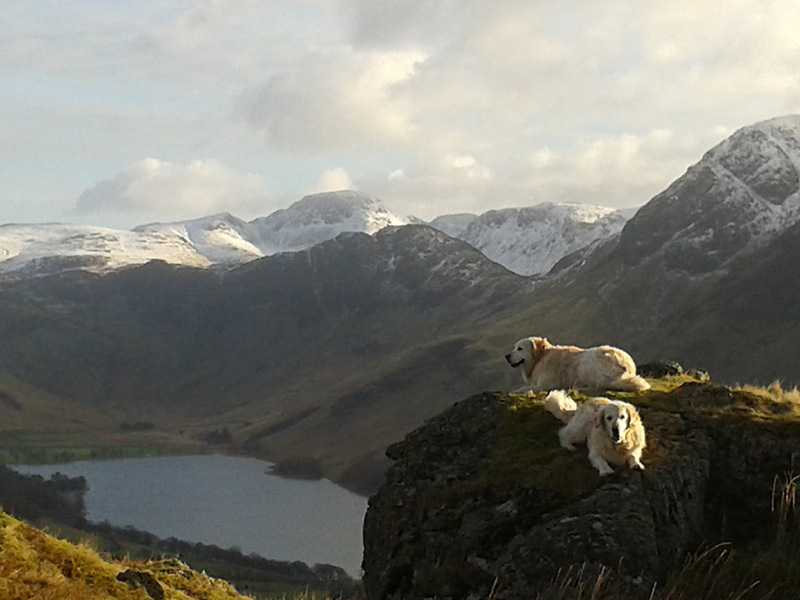 Summits include on the left, Fleetwith Pike, snowy Green and Great Gable (Haystacks in front) Kirk Fell, High Crag, High Stile to the right. For those with keen eyes . 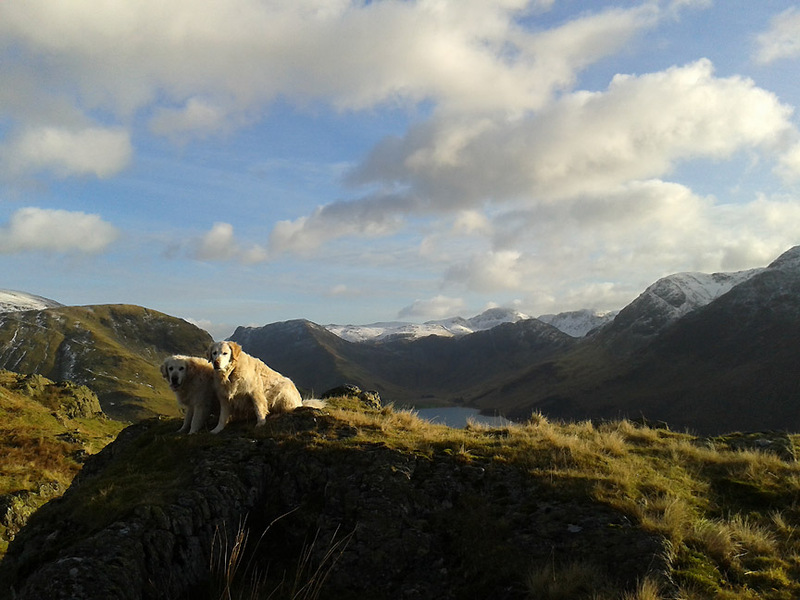 . . Scafell Pike summit can just be seen over the back. Zoomed in, but again the phone's camera struggles with clarity on the close ups. Still it is doing remarkably well on the general photos. 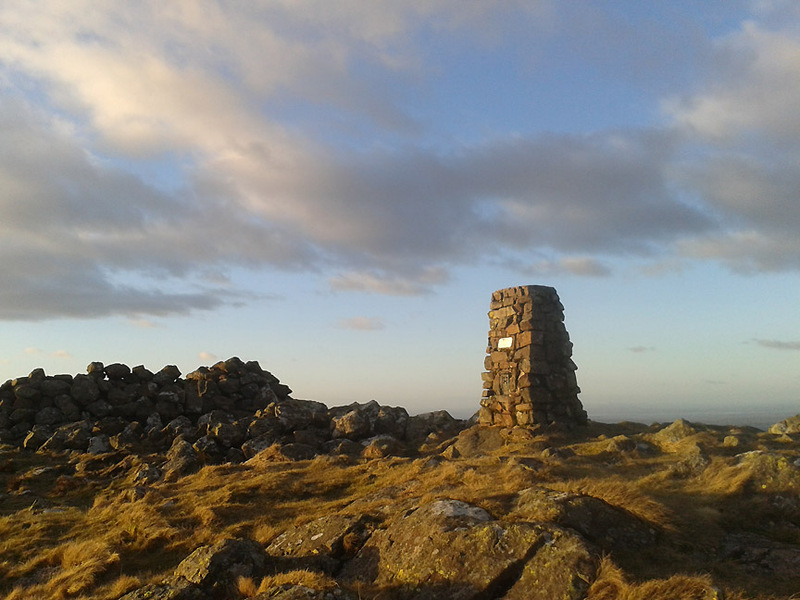 The summit rocks, shining nicely in the late afternoon sun. The summit cairn on Rannerdale Knotts. 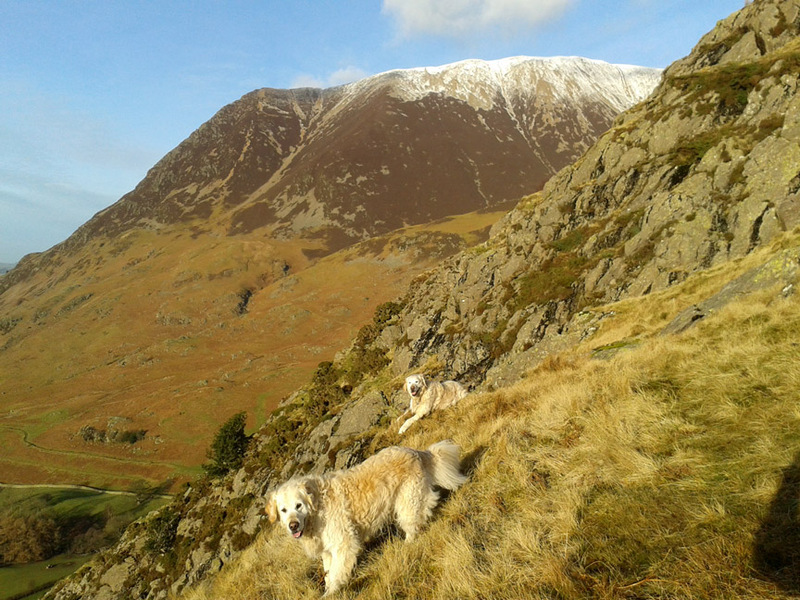 Two dogs on the next little Knott. 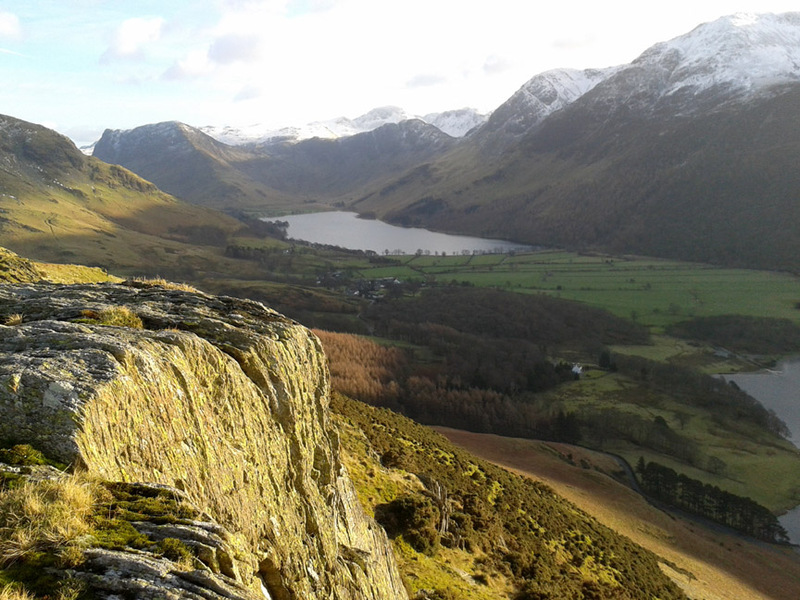 Zoomed in with Haystacks, Gable and Scafell Pikes behind. 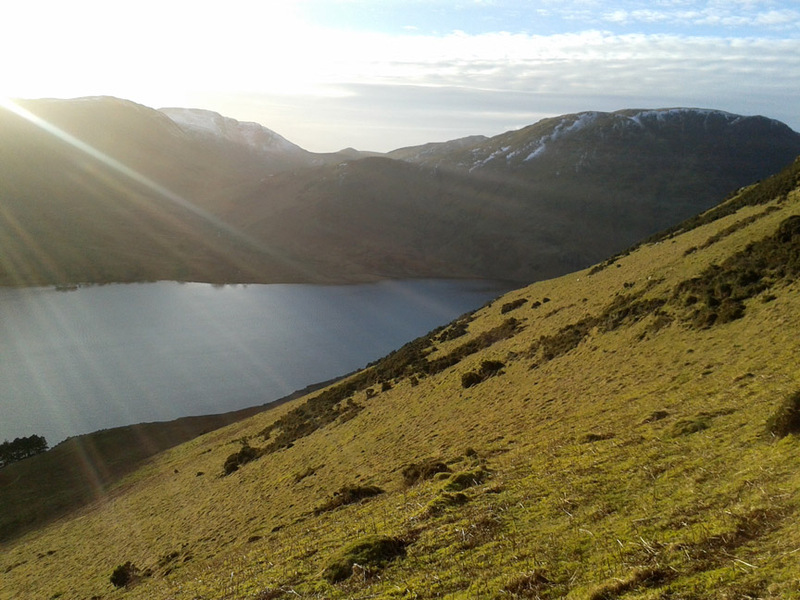 A low sun casts a nice flare across the lens as we cut down the sunny side of the fell. 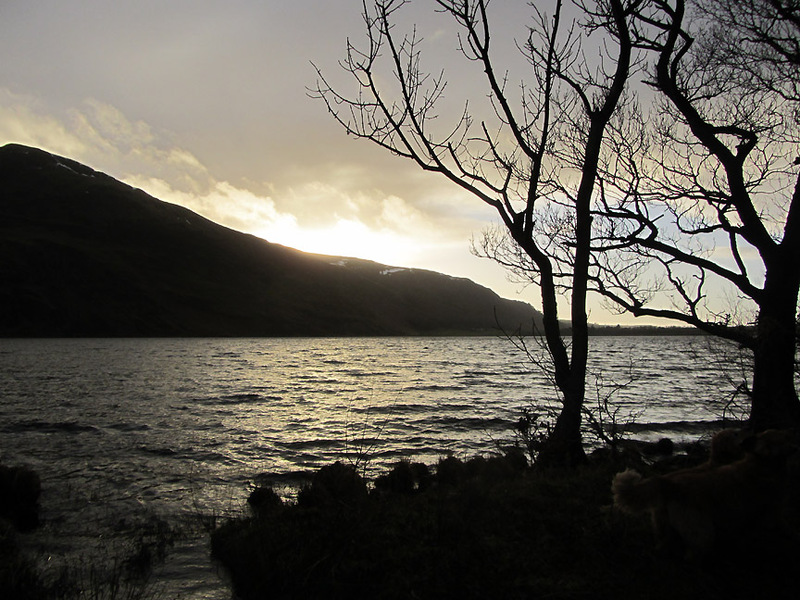 By the time we reached the old Buttermere track and Hause Point once again the sun was setting. We had walked into the shadow and the colours have gone. Still it has been a grand day and a busy one . 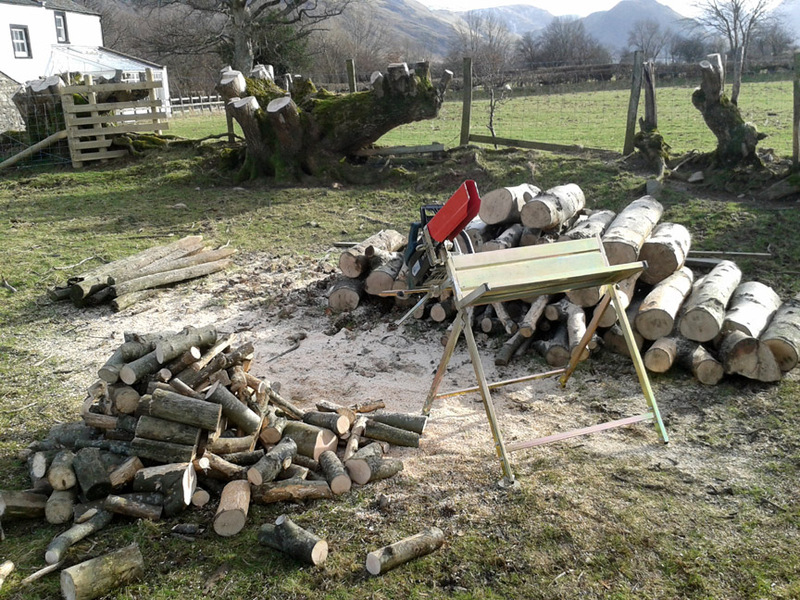 . . home now to enjoy that warm log fire !! They say log fires warm you three times . . .
First when you collect it, secondly when you saw it up into logs and of course the third time when you burn it in the grate. Has that kettle boiled yet . . . now I've got to work out how to get the photos on the computer ! Technical note: Pictures taken with Samsung Galaxy 3 Mini Phone camera ! This site best viewed with . . . a youngster to tell me how the rest of the phone works.